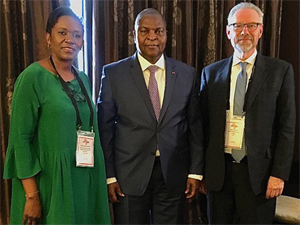 Faustin Archange Touadera (center), President of the Central African Republic, flanked by Mar ie-Chantal Kaninda (left), Executive Director of the World Diamond Council, and Stephane Fischler (right), WDC President, during the 6th Forum of the Africa-Belgium Business Week in Genval, Belgium. Expanding the scope of the Kimberley Process to include issues related to human rights and labor relations, as is being advocated by the World Diamond Council (WDC), will help create conditions in which Sub-Saharan Africa's artisanal diamond miners can meet their economic potential, and so support the development of their countries' economies, Marie-Chantal Kaninda, Executive Director of WDC, has told the 6th Forum of the Africa-Belgium Business Week, meeting yesterday in the Belgian town of Genval. Ms. Kaninda was delivering the opening address in her capacity as Honorary President of the forum, which is organized by Africa Rise, a Belgian organization that promotes Africa's economic and social emergence through contacts between its entrepreneurs and their counterparts from other parts the world. The guests of honor at the forum were Faustin Archange Touadera, President of the Central African Republic (CAR), and Charles Michel, the Belgian Prime Minister. Referencing the peace agreement signed in February by the CAR government and 14 rebel groups, aimed at ending the country's seven year-long civil war, Ms. Kaninda expressed the WDC's optimism that the end of the conflict will precipitate better prospects for the African nation. "We believe that through the implementation of the peace process, the CAR will be able to resume the unrestricted export of rough diamonds, supported by the Kimberley Process Certification System, and, paraphrasing the President, help turn the CAR resolutely towards its development," she said. 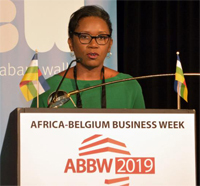 WDC Executive Director Marie-Chantal Kaninda addressing the 6th Forum of the Africa-Belgium Business Week in Genval, Belgium. Although the CAR remains under Kimberley Process suspension, forbidding diamond exports from areas falling outside of the so-called green zones in the western part of the country, from which diamond exports are approved monthly by a monitoring team, its government has been working closely with the Kimberley Process to enable the sale of artisanally-mined alluvial stones. The WDC strongly advocates that the CAR and other countries where artisanal diamond mining is prominent enjoy similar benefits from their production as do other African countries that have seen their economies and nations transformed by the proceeds from diamond sales. Improving the living and working conditions of workers in the diamond mining industry, as well that of workers in other key sectors, like agriculture and forestry, will have a positive impact on the communities that they support, Ms. Kaninda said, as well as other sectors of the economy and the country in general. "These are the developments that we would like the Kimberley Process to support, through the expansion of its scope," she noted. "Someone wrote, 'When Africa awakens, the world will flourish,'" the WDC Executive Director stated. "Indeed, Africa needs to awaken, especially Sub-Saharan Africa. When we talk about this great and beautiful continent, we still talk too often about violence, lack of democracy, poverty and corruption. 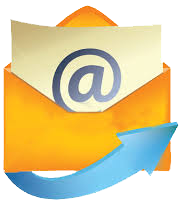 These are evils and words that we would like to feel or hear no longer." "When we talk about Africa we still refer too often to developmental aid. Yet we all know that real development comes through education, work and direct investment. It is time for Sub-Saharan Africa to rise up and develop all its human, mining, agricultural and energy potential, to escape from its state of under-development and enter a new era," she said.